The Stud_mucked feature is a convenient way for players of stud games to review the previous hand or see what hole cards their opponents mucked. This feature works for Stud high, Stud High/low, and Razz games. 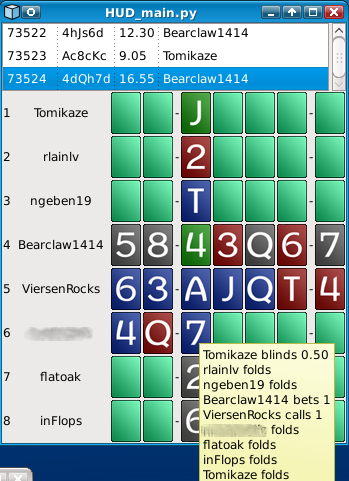 Below are a couple of screen shots of the mucked cards window, showing 2 different cards images and the tooltip containing the action for the selected street. You need to make several small edits to your config file to enable the Stud_mucked feature. Before you do anything, make a copy of your working config file in case you need to fall back to a known good configuration. Always do this when you are manually editing your config. Now open your HUD_config.xml file in your text editor. Edit the screen_name attribute for each site where you play stud. 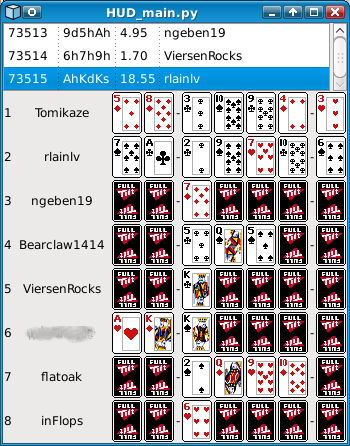 Here is an example for player MobyWhale at PokerStars. Moby's attributes are each on a separate line—yours are probably all on the same line. Do that for each of the stud games in your config. Don't forget to save the file when you are finished. Some free images are here. A wide variety of images are for sale on TiltBusters. There is a long forum thread discussing these images here. Some poker rooms (notably Full Tilt Poker) shuffle the mucked hole cards in the hand history saved to the players pc. The stud mucked window just displays those cards in the same order as the hand history. There is also a bug in the current (as of alpha10) in the importer that does not capture some hole cards on Full Tilt.